Arizona Sen. John McCain says he’s grateful for the outpouring of support after his brain cancer diagnosis. He’s promising to be back soon. 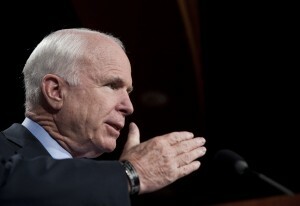 McCain’s office said late Wednesday that the 80-year-old senator had been diagnosed with cancer. Doctors in Arizona removed a blood clot above his left eye last Friday. Pathology tests revealed a brain tumor associated with the clot. McCain has been recuperating at his home in Arizona.